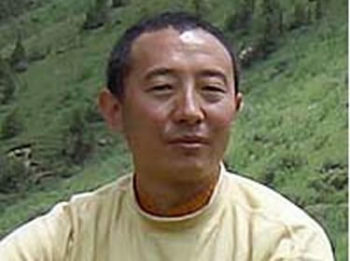 While at Gar Monastery Lama Thubten Nima studied tantric ritual practices of the Old and New Schools, and engaged in a wide array of other religious trainings. Lama Thubten Nima received special training from the Hlo Lungkar Monastery Chant-master (religious ritual master), Lama Yungthar, including the Eight Heruka Sadhanas, the Embodiment of the Masters’ Realization, Vajrakilaya, and Essence of Great Bliss. 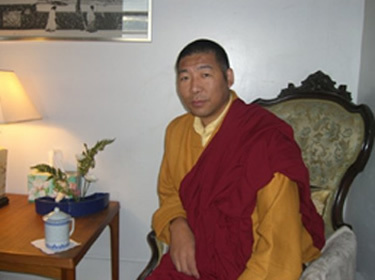 He then served as chant master for Gar Monastery and later as the disciplinarian. In the year 2000 Lama Thubten Nima went to India and received the complete Drikung Kagyu empowerments, transmissions and teachings during the Drikung Snake Year teachings. There he received teachings directly from His Holiness Chetsang Rinpoche, His Eminence Garchen Rinpoche, Drubwang Konchok Norbu Rinpoche, and many other high Lamas. Thereafter, Lama Thubten Nima went to Singapore, Malaysia and Taiwan. He then came to America to do a Yamantaka Retreat with H.E. 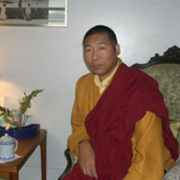 Garchen Rinpoche. 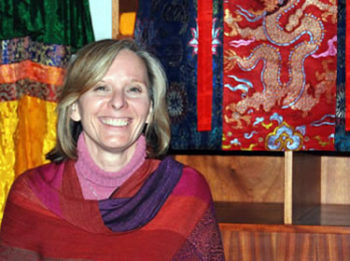 At present, he serves as a Resident Lama and Chant Master for the Garchen Institute in Arizona, as well as continuing to serve as Resident Lama for the Mercy and Treasure Buddhist Foundation (southern California). H.E. Garchen Rinpoche has also requested Lama Thubten Nima to serve as Chant Master at all the Garchen Buddhist Dharma centers in the West.